Posted by liverpoolchamber in 2008, Capital of Culture 2008, Charity, Culture. dot-art is delighted to announce the launch of the first exhibition to take place in their new three part display space in Queen Avenue, Castle Street; featuring the work of celebrated Liverpool artist Stephen Collett. The collection was exhibited in three locations in 2008 and was viewed by over 10,000 people. After a successful year which included solo shows in Liverpool, London, Berlin and New York, Stephen approached dot-art with the idea of auctioning the collection in aid of charity, as a way of both celebrating the success of 2008 for the artist and the city as a whole, and to benefit a range of worthy causes who are struggling in these uncertain times. All profits from the sale of the collection of nine paintings will go to the following charities, personally selected by the artist: The Painting Project in Rio, The Bedford Road Community Centre, Age Concern and Macmillan Cancer Research. Three additional paintings, all depicting Liverpool have been created specifically for the exhibition, and will also be available to buy. The entire collection will be available to view at dot-art, 16 Queen Avenue, Castle Street from the 2nd February – 2nd March, and online at www.dot-art.com. The Charity Auction will take place on Wednesday 4th March at 62 Castle Street Hotel, from 6-8pm. Please call 0845 0176660 or email enquiries@dot-art.com for more details. Posted by liverpoolchamber in 2008, Capital of Culture 2008, Culture, Events. Liverpool is to say a special thank-you for everyone’s support throughout its year as the UK’s European Capital of Culture 2008. Cultural venues across the city centre are throwing open their doors late into the evening as part of a special Transition Light Night, in what will be one of the biggest free events in the Capital of Culture programme. The cultural extravaganza on Saturday, 10th January 2009 – a year to the day the city officially launched its culture year – marks Liverpool’s transition from ’08 to its Year of the Environment. The evening will kick-off with a spectacular ‘People’s Celebration’ along the Mersey waterfront and new-look Pier Head. This free waterfront party will be a multi-media sound and light spectacle – the first event on the iconic World Heritage site since the extensive £100 million pound regeneration of the Pier Head public space. Posted by liverpoolchamber in 2008, Culture. 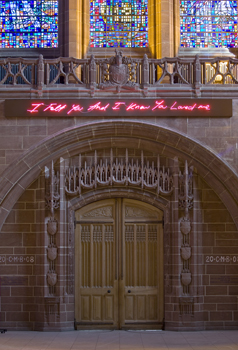 The short list of six artists for the Liverpool Art Prize 2009 has been chosen by a panel of judges from over 80 nominations received from the call for nominations which took place during the Liverpool 2008 Biennial. Posted by liverpoolchamber in 2008, Business, Capital of Culture 2008, Liverpool. Liverpool’s famous Lewis’s store takes a seasonal look back at 2008 in their magical Santa’s grotto, opened daily in the run up to Christmas. Lewis’s was the first department store in Liverpool to have a grotto, way back in 1879, and this year they want to say a special thank you to all the loyal shoppers who have supported the store through the last year. Covering 10,000 square feet this is a magical experience following the adventures of Lewis Bear who, like the store, is celebrating his 150th birthday. Be prepared to see a Santa Superlambanana and a festive take on the MTV awards in the third floor of Lewis’s Ranelagh Street shop. Free to walk around or £5 to receive a gift (10% goes to the charity Give A Child A Chance). Every child receives a balloon, badge and activity sheet on the way into the grotto. Posted by liverpoolchamber in 2008, Capital of Culture 2008, Culture, Liverpool, News. The Arts and Cultural Grants programme for 2009/10 will be announced shortly. In advance of the grant scheme going live we would like to draw your attention to the following programme of briefing sessions and surgeries which aim to provide officer support during the application process. Click ‘more for the dates and venues of the sessions. Posted by liverpoolchamber in 2008, Capital of Culture 2008, Culture, Liverpool. Regeneration in Liverpool has been accelerating at a rapid pace in the last few years. More than £3 billion is being invested in major projects which are changing the face of the city. Being the European Capital of Culture in 2008 has further aided this renaissance through drawing in new visitors and bringing attention to Liverpool’s cultural offering. However, following Capital of Culture year what is the future for the city? Can the regeneration momentum be maintained in an economic downturn? What are the implications of changing regional structures for the city and surrounding area? This conference seeks to examine the impact of the past year on Liverpool’s development, the impact of regional governance changes and their implications for regeneration and the city’s ability to weather the current economic crisis. Posted by liverpoolchamber in 2008, Capital of Culture 2008, Culture, Events, Liverpool. Chester’s famous Watergate St Gallery is back on tour, this time in Liverpool with Ian Fennelly, acclaimed Merseyside based artist. The exhibition is free for all members of the public and will showcase iconic Liverpool landmarks and buildings captured with Fennelly’s typical charm. Following huge success back in March when Fennelly toured with the Watergate St Gallery in Manchester, and more recently to a grand reception in Florence, this time he is back where it all started, in Merseyside, where his inspiration began with ‘The Greatest Hits of Liverpool’, and this time he is exhibiting his famous talent in the city for two months in line with the Capital of Culture celebrations! 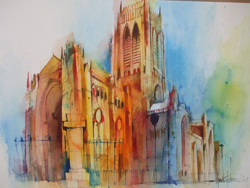 Ian Fennelly is an acclaimed cityscape artist and will be exhibiting his stunning artwork in the RENEW Rooms at Liverpool’s Tea Factory in association with RIBA Northwest and Chester’s Watergate Street Gallery.